Campaign atmosphere at 6:30 am April 23, 2018 in France. Duration: 04:05. Campaign atmosphere at 6:45 am April 6, 2016 in France. Duration: 01:12. Crowing of a rooster (x1). Duration: 00:02. Crowing (20 times). Duration: 01:11. Two crows give the reply. Duration: 00:04. About fifty sparrows chirp as they prepare to sleep in a small hazel. Duration: 00:52. Song of the eared owl to 10 or 15 meters. Duration: 01:15. Flight of a pigeon from a tree branch. Duration: 00:02. A pheasant sings in the countryside in the early morning. Duration: 01:07. Several cries of ducks. Duration: 00:21. 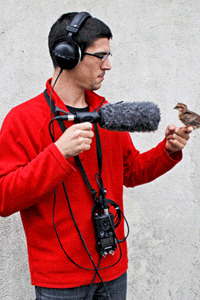 About fifty sparrows fly away when I come to find my microphone recording crying before sleep. Duration: 00:21. Long-eared owl 1. Duration: 00:44. Campaign soundscape: rumor and birds singing. Duration: 01:12. Bird songs recorded at 1 am. It is essentially the "Philomene Nightingale". Thanks to Luc P., for the identification. Duration: 02:06. Two barn swallow (Hirundo rustica)s squabble visiting a barn, future place nestled. Duration: 00:06. Cries of crows in a sub urban wood. Rumor of a road. Duration: 00:32. Cries a young bird and an adult in a nest. Duration: 00:15. Ambience sound inside the Australian aviary of Thoiry Zoo. Duration: 01:38. Two barn swallow (Hirundo rustica)s squabble visiting a barn, future place nestled. Duration: 00:38. A young bird in its nest. He calls his mother. Duration: 00:13. A barn swallow (Hirundo rustica) comes to feed his nest of swallow. Duration: 00:06. Flight of a pigeon. Duration: 00:07. Ambience sound inside the Australian aviary of Thoiry Zoo. Duration: 01:54. A barn swallow (Hirundo rustica) comes to feed his nest of swallow. Duration: 00:05. Indoor riding arena. Duration: 01:17. A barn swallow (Hirundo rustica) comes to feed his nest of swallow. Duration: 00:07. A barn swallow (Hirundo rustica) comes to feed his nest of swallow. Duration: 00:02. Bird Song 3 (Toy). Duration: 00:04. Bird Song 4 (Toy). Duration: 00:05.